I love Google Keep for taking notes because it’s flexible, easy to use and has a great home screen widget for Android devices. Now, it’s getting an upgrade that’ll make it useful for creating professional documents. 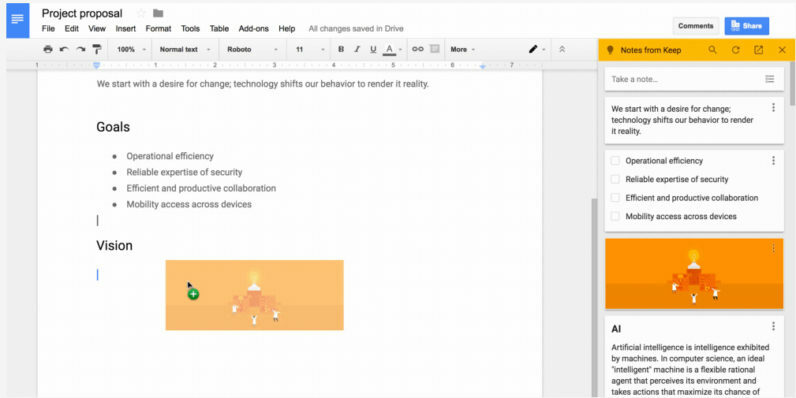 Keep is now integrated into Google Docs, so you can rifle through all your notes and drag their contents right into your new document. That’s especially handy for when you’ve jotted down bullet points in a note that you’d like to elaborate on, or a photo from your phone you want to add quickly. It’s a clever way of making Keep more useful for people who often scribble ideas on their phones. You can access Keep in Docs on your desktop by launching the sidebar from the Tools menu. Keep has also been added to Google’s G Suite of productivity tools, so business users signed up to the program can now use the app with their work accounts. If you’re tiring of more bloated options like Evernote, it’s certainly worth a try.